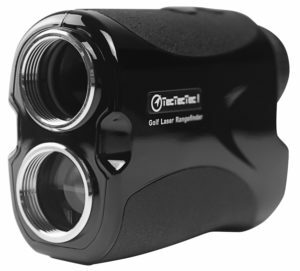 The TecTecTec VPRO500 is easily the best golf rangefinder for those who want a good balance between price and functionality. It’s not as expensive as some other models with similar feature sets, while still providing everything you’ll need during your average game of golf. The rangefinder is lightweight and compact as well, and it’s easy to use with an intuitive interface that should work well for beginners as well as advanced users. It can measure up to 540 yards in continuous scanning mode, and can detect smaller objects more effectively thanks to the advanced technology featured in its sensors. The maximum accuracy resolution of the device is 1 yard, and it can additionally detect objects that are overlapping each other thanks to the “Pinsensor” technology developed by the company. This makes it ideal for areas with a more crowded profile, including places with more foliage and other obstacles which could confuse other devices. The TecTecTec VPRO500 fares especially well in wooded areas and in situations where the flag is surrounded by various other objects. Using the device is quite easy thanks to the intuitive interface which offers you everything you need right at the viewport. You can use the continuous measuring mode to get an up-to-date scanning result while re-aiming the device, and you can easily use it to get your bearings in an unfamiliar area before deciding how exactly to proceed with it, and where to place the device for its next measurement. Last but not least, the VPRO500 is a great choice for those who value the compactness and lightweight factor of their devices, as it’s one of the smaller and more portable models in its class. It doesn’t rely on too many additional parts in its operation and can be easily packed away in a few steps, while its battery lasts long enough to ensure that you won’t have to constantly worry about keeping it charged. All in all a solid bet for those who want something that will work straight out of the box.